The Split PCD Cup Wheel segments are embedded with PCD “fragmented” pieces. This allows the segments to expose a constant sharp PCD edge for effective coating removal without leaving the aggressive profile left by traditional PCD segments. The 6 Segment Cup Wheel has been designed with large beefy segments to enable aggressive removal of coatings and surface preparation. The large spacing between the segments provide for quick evacuation of debris and dust. The 6 seg cup wheel is available in 30/40 grit in order to provide flexibility over a wide range of surfaces without sacrificng tool life. 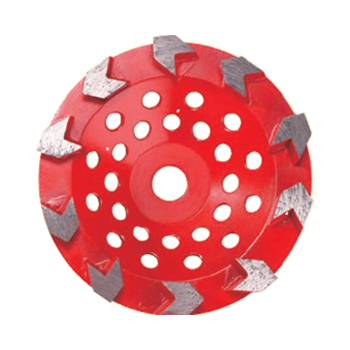 The Arrow Cup Wheel is designed for aggressive grinding. The placement and orientation of the segments are designed for high stock removal while providing maximum tool life. 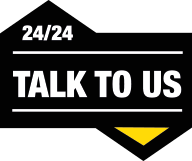 The Rhomboid Cup Wheel is designed to remove thin mill floor coatings such as epoxy, glue, mastic and paint on SOFT or ABRASIVE concrete. The diamond bond matrix has been engineered with a unique proprietary blend of diamonds and other materials to provide a superior tool while maintaining long tool life. 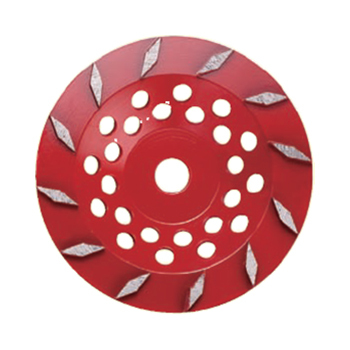 BSP tools manufacture provide various kind of Coating removal diamond cup wheel in different girt size, With the help of PCD or other speical diamond, it can remove and grinding off the painting, epoxy and other chemical material. Both OEM and ODM are available. BSP tools supply Coating removal diamond cup wheels for grinding machine like HTC or Husqvana. 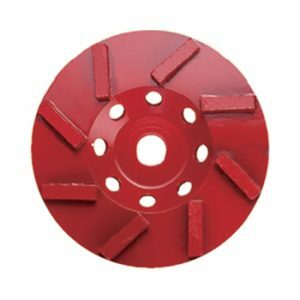 BSP tools Coating removal diamond cup wheel have soft bond for hard concrete, medium bond for average concrete, hard bond for soft concrete or coating and epoxy removal. Also diamond grit size is from 25# to 120#. 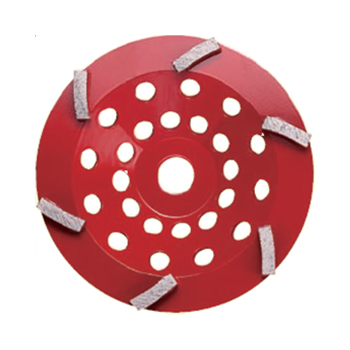 BSP tools Coating removal diamond cup wheel used for concrete cleaning, thin coating removal, edging and concrete removal.